Buying or selling goods and services involves processes that technology has thankfully managed to simplify. One important aspect is locating a buyer or a seller that can give you what you want at the most suitable price, something that online listings like classifieds.co.zw have been delivering for a while now. One Zimbabwean developer, Chiko Mukwenha, has created a stripped down B2C solution that connects businesses and individuals with buyers for their products and services. Through the bootstrapped efforts of a small team, Mukwenha has launched a web based solution called lookingfor.co.zw. It offers both buyers and sellers a platform to “look for” whatever is relevant based on description and specification. It essentially acts as a business lead generation tool. 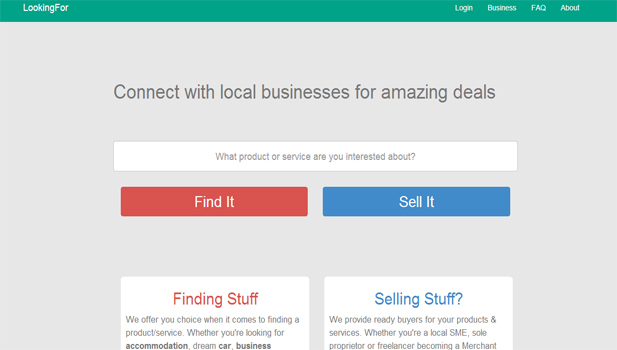 By clicking on a Find It or Sell It tab, a user is able to get details of whoever has the specific product or service and in the case of sellers, anyone looking for such. Buyers do not pay for the service but sellers have to pay for the details of a client who is looking for a product that matches what they are offering. This is simplified by a subscription model that gives the seller contact details of potential clients thereby helping businesses to zero in on sales prospects. With a focus on being a business lead generation tool, lookingfor.co.zw has managed to create a good impression in its early stages. The service, which is in the beta phase, has been running for more than four months with more than 40 registered businesses that include Zimcarsales, Meikles, Arundel Auto, Guest and Tanner and Eden Properties. We managed to have a quick chat with Mukwenha at the recently ended Startup Weekend Zimbabwe where he was participating as a developer in one of the 11 teams. Here are some of the questions he managed to address regarding their startup and service. – What problem are you solving with this service? We know people have a hard time finding products they want to buy or picking a provider for something they need. They are accustomed to the offline shopping experience where they hop from one shop to the next, which is often a time waste. The process is even more frustrating if you are looking for a particularly specific product. Sometimes you simply don’t know where to start. lookingfor.co.zw helps consumers with easy product and service discovery at the same time providing local businesses with ready buyers. – What inspired you to solve it? I have worked as a freelancer and entrepreneur and have been a shopper for most of my life and understand the problem well. Being able to create a business based around my passions, tech and business to simplify life for businesses and consumers just hit the right spot for me. – What business model have you adopted for this service? Our business model is subscription based. Businesses join our website to gain access to a constant stream of ready buyers supplied via SMS and email. The beauty of our product at this time, is our understanding of the nature of the market and realizing the lone seller at the corner of Ximex needs access to buyers therefore we offer once-off deals as well, where we send business lead details with no subscription obligations. – Is there any other local app or service you are viewing as competition? As far as I can tell, we are inventing a new category in the market. We are the first business lead generation tool and our prime focus is giving businesses ready buyers. Connecting consumers and buyers, whilst empowering anyone to sell is something entirely new so in terms of direct competition, there’s none. 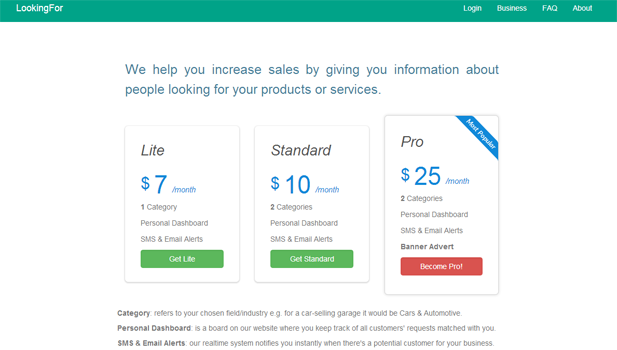 From interaction with our users, businesses compare their investment in us alongside forms of reaching customers like regular advertising (print advertising, TV, outdoor online and so forth) Our unique edge is clear though; benefit from our platform is easily measure via the leads you get and businesses find that invaluable. The lookingfor team is currently working on growing their community of buyers as well as having businesses and resellers signing on to their service. Mukwenha says that they are keen on harnessing social media effectively to do this together with an offline presence in the coming months as they gain traction in the market. Amazing. This is a fresh-eyes look on the problem. Great to see such local efforts to better our lives on ecosystem I’ll invest in this on any day! This may not even succeed, but as a blueprint to building a startup, which he stated was his intention here: http://www.saharahacker.com/post/77997863249/how-i-launched-my-startup-on-a-10-budget and now with over 40 businesses I wish this young guy luck! Zimbos we are quick to shoot each other down & I hope that doesn’t discourage his efforts. Go Guys! trust me he needs all the criticism he can get. aaaand! Mr lookingfor.co.zw wont have an influx of unsolvable queries in his inbox like people looking for things he simply doesnt have. rather show us who/whats in the shop so we know whether to come in or not. Gudoguru, thanks for the comments. disclaimer: I work for lookingfor.co.zw. We appreciate both negative and positive feedback. We are not another classifieds service so we will not be listing corporate offers on the site. However, we have expanded our business network so much that we are confident our network can fulfill any request from any category. A key metric we introduced is full response to all requests within 48 hours. Thanks again! when can we expect mobile applications both Android and iOS? I think what you will realize, for most businesses with startups aside is that for it to gain massive traction it needs either a big marketing budget or viral effect. Even Econet invests massively in advertising so i don’t know if these guys have that big a pocket but marketing it may be crucial. The ideas of a number of start up companies are good, but unfortunately most ideas have been done else where and better with a global target. Secondly in this part of the world alot of consumers (local and regional) do not have disposable incomes to buy products or services on the internet or via an app.